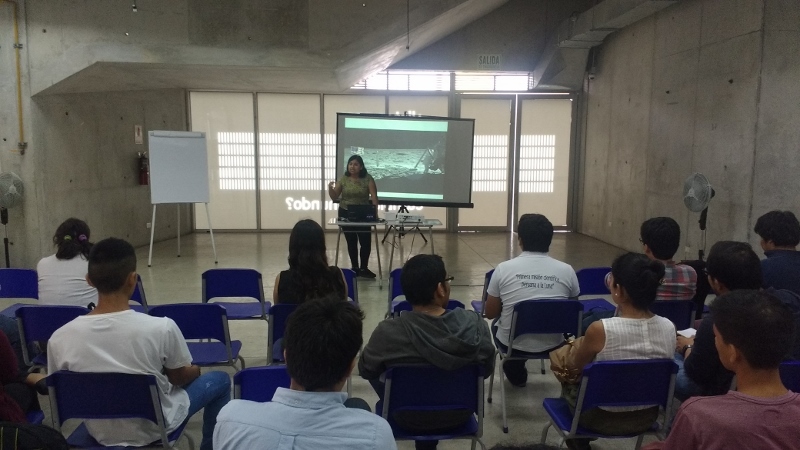 On April 14, 2018, SpaceUp unconference took place in Lima, Peru, at “Universidad de Ingeniería y Tecnología”. 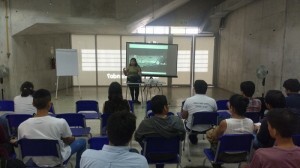 SpaceUp Peru was organized with the help of several institutions: The Mars Society Peru Chapter, Universidad de Ingeniería y Tecnología (UTEC), Space Generation Advisory Council (SGAC), and the Peruvian Space Agency (CONIDA). UTEC was responsible for the most of the logistics, mainly for the setup of the auditorium and the room for the participants’ talks. 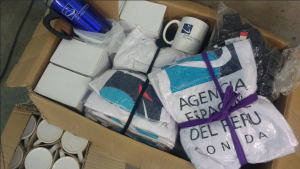 CONIDA’s support was in providing souvenirs for the participants as well as an inviting a guest from their CNOIS facilities who gave a talk about the satellite PeruSat-1. 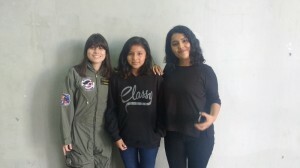 The Mars Society Peru Chapter was in charge of the program and media management prior to the event. The institution also worked on the search for the funds needed for the materials. Space Generation Advisory Council supported the event promoting it through social media and the Peruvian mailing list of the organization. The event was attended by almost 100 participants. Coming up April 28th, 2018 at University of Lagos, SpaceUp Nigeria is a one-day space unconference about the space sector. At SpaceUp Nigeria you will meet fellow space enthusiasts and hear speeches from expert panelists. As in any SpaceUp event, you are also encouraged to give a presentation! We welcome all of our participants to express their views and opinions. 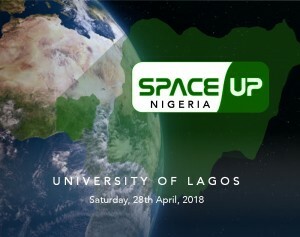 The program of SpaceUp Nigeria includes two main events: the Unconference itself, which is going to be held during the daytime, and the Astronomy Barbeque in the evening. There also will be a Night Sky Watching and a live DJ-set. Participants will be provided with food and SWAG bags! The Space Affair is burgeoning in Nigeria aka Naija! Watch out for more as the lovers of space are brought together in the beautiful metropolitan city of Lagos to interact and have fun. Important topics in the space sector will be discussed in an atmosphere of total freedom and relaxation, where participants get to decide the topics and the structure of the event. The program provides opportunity for everyone who attends to give a talk or start a discussion. There are no spectators at SpaceUp, only participants. SpaceUp Nigeria 2018 will take place April 28 on the campus of the University of Lagos, Nigeria. 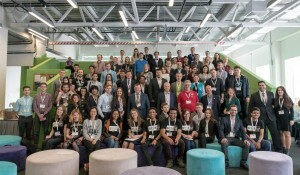 Ever since SpaceUp became a global event, people have written about the concept in different blogs and for different conferences. 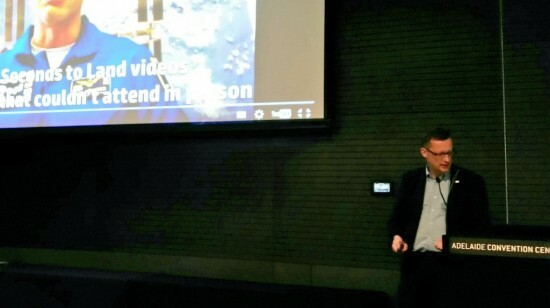 In September 2017 our CEO wrote a paper about the evolution of SpaceUp between 2010 and 2017, which was presented at the International Astronautical Congress in Adelaide, Australia. The paper describes the principles of SpaceUp, plus the success factors of why SpaceUp is such a great success. Because the paper has a lot of very useful information for SpaceUp organizers, we decided to make it available here. Please note that copyright of this paper is with the International Astronautical Federation. SpaceUp San Diego V – a success! After a short hiatus, SpaceUp San Diego returned and was better than ever. The new venue at the San Diego State University was well suited for the occasion. With 60 attendees, a full one third of participants were students, from SDSU, UCSD and other colleges and universities. The students brought hardware projects for display in Hardware Alley. Industry engineers from companies such as SpaceX, Masten Space Systems, Moon and Back Travel, Othneil Dynamics, Jules Verne Launch, Additive Rocket Corporation, Deep Space Industries, Omnisafe, and more were in attendance. With a one day format, the T minus 5 talks were moved to the beginning of the day to help spark session discussion ideas. One of the “ice-breaker” talks featured a song and a dance with Space Shuttle slippers! 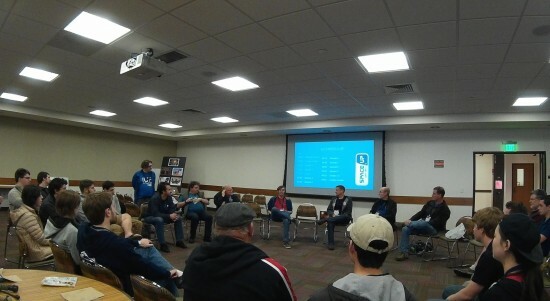 The day ended with a fascinating discussion of the future of SpaceUp focused in San Diego. The overwhelming consensus …? Let’s do this again! Let’s keep the conversation going. And let’s get-together more often. So there you have it. Let the Space Geekiness continue! Coming soon…..